For over two and half years Phonographic Memory has put on free monthly shows at the Bernal Heights Library. The programs creator, Corey Bloom, is moving to the east coast so we’re going big with the last session in the neighborhood. 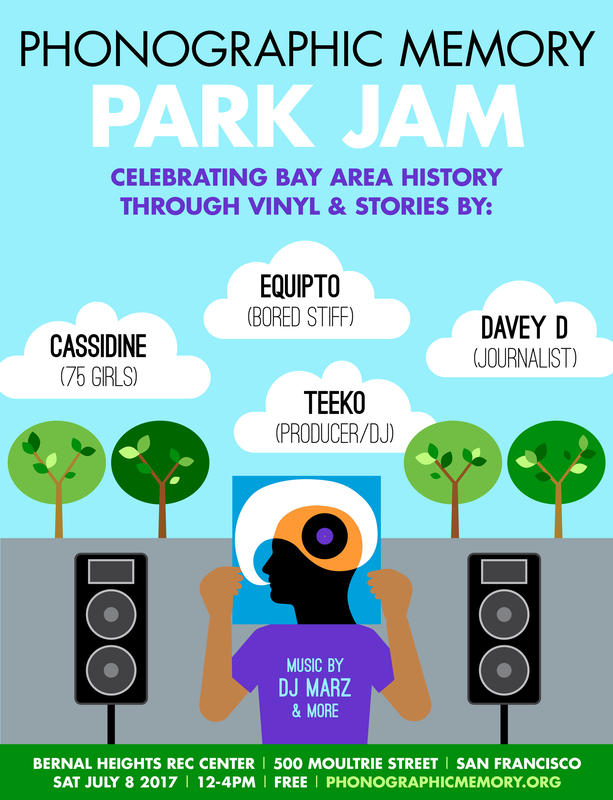 On July 8th, from 12:00-4:00PM, at the Bernal Heights Recreation Center we’re throwing an outdoor park jam with DJ’s, record vendors, community groups, a food truck and, of course, storytellers. Corey has curated the lineup to pay tribute to the depth and dimensions of the Bay Area music scene, which have impacted his life in a variety of ways. Cassidine: The first female MC on the West Coast to get a record deal who released her debut, Man Handler, on 75 Girls in 1988. DJ Marz, of the infamous Bullet Proof Space Travelers, will be holding down the music throughout the afternoon.